“C – A – N – C – E – R” my wife often spells the word when our kids are around. The idea maybe is that to name something is to give it power. Or maybe she hopes to avoid the inevitable question, “What’s cancer, mommy?” Worse yet, Isaac may tell friends, “daddy has cancer,” and no telling where that conversation leads in a school classroom full of five year olds. Whitney and I do our best to communicate with the kids openly, honestly, and with integrity. Whitney and I have been up front with our kids that “daddy has a boo boo on his brain that the doctors are trying to fix.” Isaac and the younger boys visited me in the hospital and later in the acute inpatient rehab facility following my surgery. Cancer aside, the double-digit number of staples in my head was frightening enough–especially for toddlers who aren’t conceptualizing the silent killer of malignant cell proliferation. In a flash of parental clarity, I reminded Isaac of his many scrapes and bruises suffered to his knees and elbows following rambunctious play or tripping on the sidewalk. Noah, #MiddleChild, left; Gideon, baby, right, visiting Dad at Rehab Hospital, June, 2016. Isaac visited me again a week or so later and he showed me his knee, bruise-, scratch-, scrape-, and scab-free. Lightbulb. The kid gets it. I showed him my staples. What lessons does a parent take away from this brief interaction with his son? What lessons are available for the rest of us? I think it is the following: I managed to normalize a scary and intimidating situation for Isaac. Isaac understood, in that moment, anyway, that pain, injury, and healing are familiar experiences, something he can recall, and those experiences are shared by others, too. Dad looks scary, he is in a strange place, he has a visible injury, but even if the place is unfamiliar, the experience in broad view is normal: scrapes, cuts, bruises, bangs, dings, bumps, and band aids. Let the healing occur. Our empathy is hard-wired from our great ape ancestors: in a very real sense we feel the pain of others, and our ability to contextualize, to see ourselves in the situation of another, represents an evolutionary advantage in so far as cooperation, problem solving, and social development rest on a foundation of finding threads that connect our experiences to the experiences of another, even if we have not faced their specific challenges. We think of ourselves as good spouses, good friends, good legislators, good faith leaders, good mentors, Big Sisters and Big Brothers, Rabbis, and Imams, Doctors and Nurses, because we imagine ourselves into the circumstances of our community, our cities, our classrooms, congregations, and hospital beds. Patient-centered doctors facilitate a role-reversal: they empower patients to take an active role in their treatment and recovery by answering the big question when prescribing medicine or writing orders: why? When patients view themselves as members of their medical team, these empowered patients contextualize their experience in following a treatment regimen to the doctor’s experience in prescribing one. The doctor and the patient are both sharing in the message of why a therapy is important. I call on doctors to explain to patients why a treatment strategy or plan of care is important in such a way that the patient is empowered to explain the same information to her family or friends. A doctor’s one-on-one communication with a patient is equipping the patient to have the same conversation with her loved ones. It is not one-on-one, but doctor-to-patient communication is one-to-many. How might a doctor’s communication with a patient change if she realizes the conversation is not only to inform the patient but equip the patient to inform others? Good doctors and empowered patients walk (or roll, scoot, transfer, gait belt, etc.) together. It is a partnership. My scalp itches and burns. It’s my electric cancer hat. To maximize therapeutic efficacy, patients are instructed to meet a ‘compliance’ threshold for wearing the device. Compliance is a recommended 18 hours of daily use, but my oncologist (and clinical data) suggests that longer duration of daily use translates to increased therapeutic efficacy. The system includes an adapter for wall-outlet power and a 2 1/2 pound backpack (when loaded with the device and a battery) for getting around or out of the house. The device is wired to a medical-grade adhesive holding multiple series of ‘transducer arrays’ that emit alternating electric fields, targeting a solid mass tumor. The electric fields disrupt the process of cellular division (mitosis). Maintenance requires patients change the arrays every two to three days, depending on a number of variables. Optune is FDA-approved for glioblastoma, so I presuppose this application in the remainder of this post, but TTFields are currently in clinical trial for brain metastasis (#bcmets) and mesothelioma. I change my arrays more often because, no secret to many of you, my super power is growing hair. The arrays must be in contact with a shaved scalp, and hair growth can interfere with array-to-scalp contact, causing hot spots, and disrupting therapy. When I stretch the arrays out to three days without a change, my rapidly growing hair causes the arrays to lose contact with a freshly-shaved scalp, and the device ‘alarms’ (*beep beep beep*)–not great for uninterrupted sleep. So it’s every other day for me that I remove the adhesive and arrays, treat my irritated scalp with shea butter, hang out, feeling liberated for a couple of hours, then shower, scrub my scalp, shave, and Whitney applies a new set of arrays. This is our routine. It has been more difficult for me to adjust to than I imagined it would be. It may not be too hard to understand why. Mitch Hedberg tells a joke about how uncomfortable it is to wear a turtle neck with a backpack. I describe wearing Optune in similar terms: it’s like wearing a snug beanie and carrying a large bag, 20 hours a day. The bag restricts your movement and the beanie makes you hot. You’re hot and restricted! It is hard not to become irritable. Me, Normalizing Optune and Minivan Shopping with my Wife, November, 2016. I nearly abandoned the Optune effort, but what I have failed to recognize until just a day or so ago is that I have not answered for myself why it is important I follow through with this therapy. There are at least three reasons, the first of which is obvious, and the latter two are consistent with the themes of this blog. First, clinical trial suggests newly diagnosed glioblastoma patients experience an increase in overall survival with Optune compared to standard of care (SOC) alone. Second, I am a pioneer in a new treatment modality. Yes, Optune is FDA approved and is frequently becoming another SOC protocol in the treatment of GBM (resection + radiotherapy + chemo + Optune), but we are early in discovering the wide ranging applicability of TTFields in the treatment of solid mass tumors. It is exciting to consider myself a partner in this new frontier for treatment. Third, as a novel therapy, it is patient responsibility to help push cultural norms to improve the experience for future patients. Normalizing the wearing of Optune allows me to confront uncomfortable or strange interactions in public so that the next GBM patient may walk through the restaurant, car dealership, kids’ preschool, or grocery store without feeling the weight of quite so many eyes. Like Isaac’s skinned knee, the staples that were in my head, and now Optune, I am wearing my cancer. It is easy to hide behind the visuals that project our pain to the world, yet we all realize, don’t we, that these are superficial and cosmetic; the tips of the icebergs. We, each of us, carry pain, heartbreak, embarrassment, fears, and injury, just below the surface, not in the light of day, exposed for the wandering eyes and strange looks from others. I think ultimately I wear Optune because I am coming to understand the act of wearing the device expresses solidarity with all of us facing hot heads, heavy bags, and restricted movements: our jobs, our relationships, our budgets, our health. It’s tough out there, friends. I become irritable, itchy, hot-tempered, and worn out. I get short with the kids. But I also get this strange pass, right? Because of the Big C. Because of C – A – N -C – E – R. Because of Optune,and my affected gait, and my cane. Many of you have thanked me for writing this blog, and you have said wonderful things about me and my experience: that I am inspiring, uplifting, strong, positive, and courageous. Friends, you are these things. I have been branded with the global identifier of cancer. I get head tilts and sad eyes. People are soft on me by default. The model I am living up to is the one set by all of you, who face an often mean world, and you do it with enough grace and kindness that at the end of your long days you have enough energy left to send my family a card. We imagine ourselves into each other’s context, and we find empathy, strength, and partnership in that shared space. The analogies I draw from my experience and the lessons I galvanize show up in meaningful ways: this blog, like my description of doctor-patient communication, is not one-on-one, but one-to-many. I seek opportunities to tell my story, and I could not be more thankful for your support. More to come! I framed Glioblastology with an insight from the 20th century French existentialist Maurice Mearleau-Ponty, grounding our mental and emotional states in our bodies and biology. The identification of our “self” with our bodies shapes the framework through which I share content with you. It is our bodies, broken and dependent on others, which we must acknowledge are central to patient-centered healthcare, placing the person first, before the doctor, before the treatment, before the diagnosis. Our diagnoses do not define us nor supersede us, as persons; yet, neither do they exist independently from what makes each of us unique. We only are our bodies; our conditions and states, symptoms, and feelings are biological phenomena perceived through our experiences. We may also be informed by the Cartesian model of duality. That is, two things exist from which the ‘self’ is derived: there is a body and there is a thinking thing. I played with the famous claim, ‘I think therefore I am,’ suggesting that to cease thinking is to cease being. It’s my intuition that pre-reflectively, many of us understand ourselves by this Cartesian, dualist framework. I suspect a good number of folks have something like the following in mind. There is a body that ‘I’ have, and there is a pilot (‘I’ or ‘me’) at the helm, in the center of our thoughts, charting the course through our lives. These are competing views. On the one hand, the existentialist claims that there are biological processes that are responsible for our felt experiences that we naturally refer to as the ‘self,’ and say, ‘I experience,’ and ‘I feel.’ Yet this talk of I, me, and self is strictly talk of our bodies and biological processes. On the other hand, the dualist suggests that biology carries on concurrently with our thinking and decision-making, in virtue of the free choice of our will, exercised by our pilot-minds. On this latter view, bodies and minds are connected in important ways, yet distinct. There is a body we have, and there is this mind that we have. The question we are invited to consider is whether we are our bodies, only, our bodies and minds, working in concert, or only our minds, churning thoughts. Whether we can answer this question, at all, is the stuff of philosophy, psychology, cognitive science, and molecular biology. A more poignant question to consider today is what bearing our attitudes towards this question has on our suffering and illness; treatment and recovery. My attitude is that patient empowerment calls to action both medical teams and patients to find common ground in asking why? Why is this the accepted origin theory of the disease expressed by my diagnosis or pathology? Why is this treatment regimen prescribed for this diagnosis? This attitude suggests that we must treat the person, the ‘self,’ to effectively treat the body. That the road to treatment and recovery is paved with patient empowerment, facilitated through the open exchange of knowledge. This is captured in my opening remarks that we, as persons, are not distinct from diagnoses, and neither are we superseded by them. Our individual conditions make us unique, but our common bodies that we should be affected by having diagnoses with biological underpinnings, unites us all as persons, and our intellectual acknowledgement of this fact relies for its comprehension on the very same biology that makes this important claim possible. Hence, our understanding of patient empowerment evolves yet again to include the notion that biologically we are connected with each other through a rich tapestry that includes more than one billion years of cellular adaptation. One goal for the post you are reading is that we find an insight illuminated when we view our ‘selves’ as minds, bodies, and biology. That we think, we move in space, and our cells are primarily involved in enabling our mental and physical lives. This realization is so vitally important because we understand our diagnoses–especially cancer, as something gone terribly wrong with our bodies, our cells, our genes, our DNA, but our bodies just are our cells, and our minds emerge from these bodies, from these cells. Liberating our mental and emotional lives from an attitude of self-deprecation that blames our bodies for our illnesses is an early and important step toward treatment and recovery. My neuro oncologist and I discuss treatment; November, 2016. 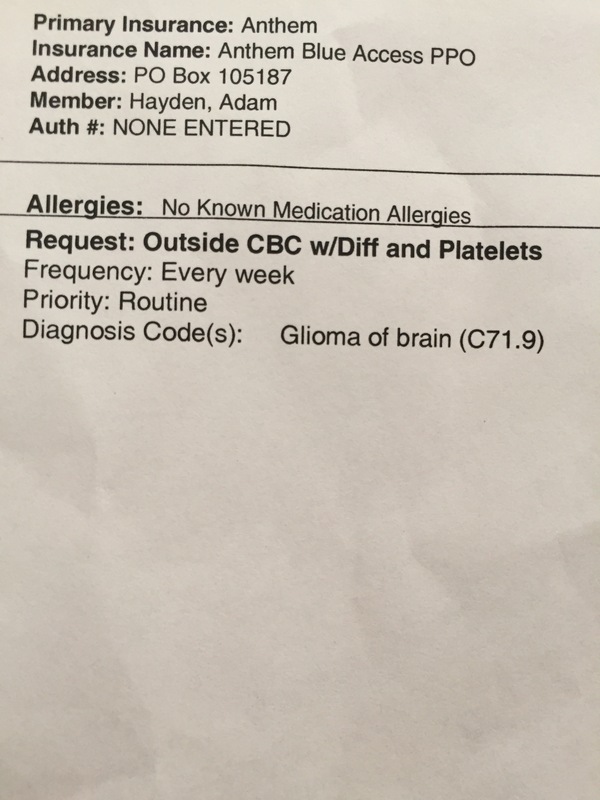 The trajectory I have followed through these early weeks of documenting my own brain cancer battle has taken us through a technical discussion, describing glioblastoma multiforme (GBM). I introduced patient-centered healthcare by way of an anecdote. Today I offer insight into the relationship between our minds, bodies, and biological foundation. In the coming series of posts I intend to explore this biological foundation through the discussion of topics related to molecular biology. Specifically, I hope to say more about my own journey with Optune, the tumor treating fields (TTF) technology. I also plan to introduce the metabolic theory of cancer as a foil to the presently accepted genetic (or somatic) theory of cancer. These discussions are helpful as a platform to share my narrative as it relates to choosing a plan of care, it creates an opportunity for you to learn more about the frontiers of cancer research and therapy, and it enables me to sharpen my science communication, a skill set I seek to expand, as I hope to offer continuous improvement with the quality of my blog posting and look for opportunities to speak as a patient advocate on panels or events. Recently I have been talking about patient-centered healthcare, and I offered a philosophical take on patient empowerment, drawing from my own experience. One important suggestion I advanced is that both patients and medical teams share common ground: asking why? In this post I focus on the patient experience. In the future we will see this question framed for researchers. Patients are often frustrated, disgruntled, and disengaged when they are not enabled to speak competently to their own treatment. I suggested a medical team is accountable to empowering patients by facilitating understanding of what to expect from treatment, therapy, or a special procedure. Most importantly, the onus is on the medical provider to illuminate why an order is an important component of a person’s plan of care. Empowered patients are more likely to take an active role in their care, treatment, and recovery. Recall a recent medical intervention, and answer the following questions: Why has my doctor ordered this test? Why have I been prescribed this medication? Why is this therapy recommended for my particular diagnosis? This is a nice litmus test for the health of the dialogue with your primary care provider. I also hope this activity reinforces the notion that patients knowledgeable about their provider’s decision-making are more engaged and diligent when sticking to a treatment regimen. Deserving of its own post, I am contemplating discontinuing use of the Optune device (tumor treatment fields (TTF)). This recently-FDA-approved (for glioblastoma) durable medical equipment (DME) slows the growth of tumor cells by emitting an alternating electric field targeting the site of tumor growth, disrupting the process of cellular division (mitosis). A full description of the therapy quickly becomes complicated, and to wrap our minds around the mechanism of treatment, we would need to get into the weeds with theory and terms, including mitotic spindles, apoptosis, and the molecular dipole moment. Of course, I would have great fun blogging on this topic, but my fun may not leap off the page (screen). You can let me know in the comments, if you want to hear more. Regardless, as I consider continuing TTF therapy I seek answers to the contrastive (why?) questions I asked you to consider from your most recent medical intervention. The Optune is inconvenient, requiring changing the equipment, shaving my head, and cleaning with alcohol. It is adhered to my shaved scalp with medical-grade adhesive, generating heat, like wearing a beanie all day, with a bulky braid of wires running from my head to a two-and-a-half-plus pound battery backpack. It is neither fashionable nor kid-friendly, and midnight bathroom breaks are more cumbersome when you are plugged into the wall socket like a floor lamp. Levity aside, wearing the equipment complicates transferring my one year old to his crib for bed; it frightens my three year old who has taken to yelling “no, daddy!” when I walk in his room; it impedes my ability to grab impromptu dinner with my wife and walk the Cultural Trail, without first thinking through stowing an extra battery or two and working out a jacket and hat combo to complement my three-pound backpack and headgear. Psychologically, wearing such equipment constantly reminds the wearer: you are ill; different; set apart. An important question remains unanswered: why is this particular therapy recommended for my particular diagnosis? The fact of the matter is this. Nothing else has stopped GBM. There is not empirical data to support alternatives to TTF therapy–at least, not empirical data that is FDA-sanctioned. Optune is an exciting, non-invasive therapy that has extended overall patient survival during clinical trial. Discontinuing treatment offers a reprieve from inconvenience, maybe improved connection with my wife and kids, and a return to some normalcy during an unsettled time. Is this trade off worth sacrificing a statistically significant improvement in overall survival time? The importance of answering this question cannot be overstated. My reality may diverge in severity from the medical decisions you face today. To put it in rather stark terms: every eight weeks I endure a 40 minute brain scan followed by an appointment with my neuro-oncologist (NO) to hear whether my cancer is growing. There is obviously much at stake, and imagine my state of mind should I discontinue TTF therapy, and subsequently discover tumor progression on an upcoming scan. I encourage us all, not as a gloomy reminder, but for your thoughtful consideration as spouses and family, to entertain the types of treatments you are willing to endure, what side effects are tolerable, and when you would decide to discontinue treatment. The answers to these questions may inform your healthcare power of attorney. Notice what is central to the preceding paragraph? These decisions are within your control. The decisions are yours to make. Decisions are to be made with the support of your medical team, and as I have already suggested, medical teams share in the responsibility of educating (hence, empowering) patients under their care. Sticking to a Controversial Treatment Regimen: What Changes? In the coming posts I will introduce the vitally important role nutrition plays in the prevention and treatment of cardiovascular disease, neurodegenerative diseases, diabetes, and, yes, cancer. Nutritional resolutions are difficult (for a myriad of reasons, proving their efficacy in a clinical setting among the most challenging) because for their success, nutritional resolutions require strict adherence. This remark is not terribly insightful, anyone who has tried out a new diet or New Year’s resolution already knows this. All aspects of food: our American cultural associations with the wholesome farm, rooted in our identity as an agrarian pilgrims, surviving on corn, and preserving in the root cellar, the happy cows from California (c), our governments’ farm bill and subsidies, Mark Bittman, Katie Couric, the paleo diet, kosher delis, meatless mondays, Weight Watchers, and Ramadan, and let us not forget Holy Communion. Table fellowship is central to physical, emotional, and for many, spiritual lives. Messing with eating practices is calling into question childhood memories, emotional coping mechanisms, religious practices, and evolutionarily-signaled cravings. Calling into question eating practices is just what I plan to do. We will explore the ketogenic diet as a resolution for cancer and neurodegenerative diseases. Keto’s efficacy is contingent on the metebolic theory of cancer, so you know we will need to get that theory on the table. Keto is about our body metabolism; metabolic theory of cancer is about cellular metabolism. Be on the lookout for my next post: Our Cells; Our Bodies. You are reading one in a series of short posts translating the patient experience to an action-oriented context for clinicians. My wheelchair was outfitted with a tray, which might be convenient if I were cruising the halls of the locked brain injury unit, snacking on Doritos I took away from lunch, sipping stale hospital coffee from a Styrofoam cup, with the red straw pinched on the end like the metal receiving mold of a stapler, greeting staff with a Cheshire grin—“should he be out of his room?” The tray, brittle plastic, sold to Boeing in the late-1970s to pop up from the arm rests. Ginger ale. Always ginger ale. The dead-fish left arm, kenesio-taped to the tray during early therapy sessions to keep it from getting caught up in the spokes of the wheelchair, had earned its independence. I was complicit in my in-room exercises, and for a reward, earned the activity of navigating my wheelchair without supervision around my room, to and from lunch, and down the hallway to my favorite reading spot, a large window at the end of the fourth floor, overlooking the main drive, a quarter mile or so, lined with trees, where I would read three Einstein papers during my stay. The staff likely is still not sure if I was actually reading Einstein, or, you know, “reading” Einstein. He pulled a chair to the center of the room. I am still unsure if the pathology report was available in my records at that time, which the neuropsychologist would have, and probably should have, read, prior to his stop-and-chat, and it is not implausible to think everyone else had read it but was waiting for my neuro-oncologist to break the news. (Which would happen four days later on June 10, 2016.) Or maybe the neuropsychologist never read it. It is also possible that the pathology report was not yet available. At any rate, my response, “…really waiting on that path report … can’t wait to hear what we’re up against,” is reason enough to suspect that this patient is unaware of his diagnosis. “Have you heard about the exciting new research for treating glioblastoma?” the neuropsychologist asks. He begins his ode to the polio vaccine: a soliloquy to research and the promise of a cure for glioblastoma. It is a grand love song to the miracles of modern medicine in which I tacitly feature as a supporting character. In fact, this continues to be—the polio vaccine, I mean, a common response to people hearing about my diagnosis. It’s not just for New Deal Presidents, anymore. This compulsion to share uplifting news grows from fascination and wonder with great respect and discomfort for our own mortality, “What if this were my diagnosis?” Our mortality is curious. It raises the Cartesian punch line that maybe I am strictly a thinking thing, and if that is the case, is that thinking separate from my body, or is it emergent from my physical processes? The churning, whirring, buzzing of a busy brain, and in the absence of these processes, so goes the thinking, and frighteningly enough, so goes me? I think; therefore, I am. Therefore, I am not thinking. Let us not give ourselves over to cynicism, it fails to be productive, but neither should we fail to learn lessons when available. My talented and bright sister-in-law would call this a #teachablemoment. I advocate a person-centered approach to healthcare, and I gather many of you do, too, if only implicitly. What I mean is this: there is a time in medicine’s recent past that, owing to any number of factors, the piss-poor antiseptic practices, the intimidation of meddling with one’s personal constitution, the inaccessibility of information, or maybe the poor track record of doctors was still appreciably better than at-home treatment, a patient would visit a doctor when sick, take his advice—certainly a “he” in these cases, and bite the bullet, drink the booze, what doc says, goes. If you’re not that sick, you don’t need the doctor, anyway, and if you’ve called for the doc, I suspect his advice ought to be followed. The doctor-patient relationship I mean to evoke in this instance brings to mind fond cultural memories of our Little House on the Prairie obsession with frontier America, unbridled horses, one-room schoolhouses, and whatever else they packed into Back to the Future III. The doctor was an authority. An expert. An altruistic one at that, and so, what reason would we have not to take doc’s prescription to heart? The following is my thesis. Our doctors do their best work when their patients are active, involved, engaged, participatory, willing, and honest. A person-centered (or “patient-centered,” if you like, but that sees the person as patient first, like the difference between “a colored person” or a “person of color,” yes? ), anyway, a person-centered approach to healthcare places a responsibility on the person seeking treatment to view their self as an advocate, as vitally important to healing, as a part of their medical team. Doctors who are committed to person-centered healthcare inspire and recognize these qualities in the persons under their care. Consider these mistakes committed by the doctor who visited me that evening: my diagnosis was unknown to me at the time of our meeting. Was I told my diagnosis during that conversation? I cannot answer that question. The polio vaccine is administered for treatment of GBM under certain conditions to patients who meet strict qualification guidelines for acceptance into a specific research trial. Was application to that research trial recommended to me during that conversation? I cannot answer that question. Dateline is not cutting edge; a recent peer-reviewed journal article in a field of specialty is. Was I provided with the resources to learn more about this new treatment option during that conversation? I was not. I scribble away in my notebook. I breathe deeply. I position my tired left arm, using my able right arm, onto the wheel, and push myself to the wardrobe in my small hospital room to begin changing for bed. The path is obstructed. Doctor has left his chair in the center of the room. Each of these transactions during this experience—the diagnosis, the clinical research, moving the chair, I was not empowered to take an active role in my own care; it was about doctor as authority, doctor as expert, and that is why this experience, despite all my rattled, broken, and fatigued body has been through these few months, stands out as one of the most negative. Power was withheld from me that evening. Soon, or in some time, we will visit a sick friend; maybe a dying friend, and this will be an opportunity to empower or to hold on to power. I ask that we embrace the former and recognize when we are stubbornly adhering to the latter for our own insecurities, fears, or discomfort.